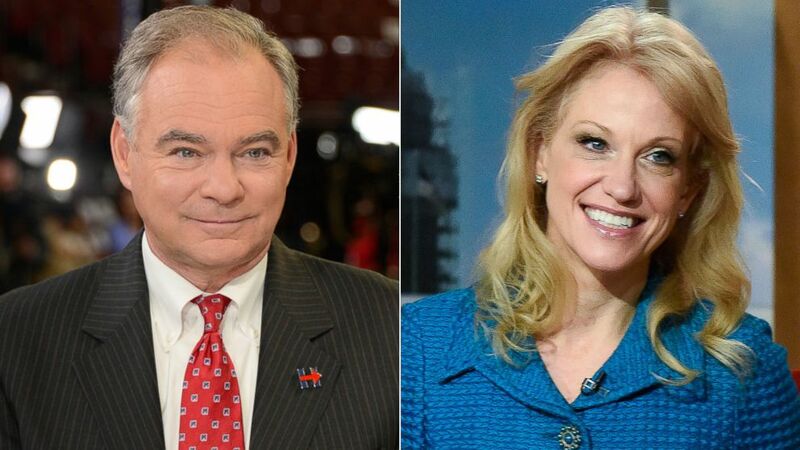 Rush transcript for "This Week" on September 4, 2016.
camera (Ida Mae Astute/ABC | William B. Plowman/NBC/Getty Images) Tim Kaine, left, and Kellyanne Conway to appear on "This Week." THIS IS A RUSH TRANSCRIPT FOR 'THIS WEEK' ON September 4, 2016 and it will be updated. UNIDENTIFIED MALE: Starting right now on THIS WEEK WITH GEORGE STEPHANOPOULOS, sprint to the finish -- a softer candidate beyond our borders. DONALD TRUMP (R), PRESIDENTIAL NOMINEE: Mr. President, I call you a friend. UNIDENTIFIED MALE: And that fiery speech when he returned. TRUMP: You can call it whatever the hell you want. They're gone. UNIDENTIFIED MALE: Donald Trump bets big on immigration. HILLARY CLINTON (D), PRESIDENTIAL NOMINEE: Dropping in on our neighbors for a few hours, that is not how it works. UNIDENTIFIED MALE: And for Hillary Clinton, record unfavorability and still more email questions. TRUMP: That is just one more Clinton lie. UNIDENTIFIED MALE: Our exclusive interviews with both sides, vice presidential nominee Tim Kaine and Trump's campaign manager, Kellyanne Conway. UNIDENTIFIED FEMALE: To the east, to the right, is Russia. UNIDENTIFIED MALE: As tensions with Russia rise, Martha Raddatz is on the front lines. Is the cold war on the verge of reigniting? It's Labor Day weekend. Game on. Counting the days. Sixty-five to the election, 22 to the first debate, just 19 to the first early voting. But for all the sound and fury of the summer, we're more or less where we were in late spring. Hillary Clinton cautiously nursing a small but consistent lead. Persistent questions about her trustworthiness making it hard for her to pull away. And Donald Trump still stuck around 40 percent, still wavering between speaking forcefully to his base and reaching out to undecided voters. RADDATZ (voice-over): Donald Trump at an African-American church in Detroit Saturday, getting an opportunity to reshape his image, reading from notes, speaking softly. TRUMP: I fully understand that the African-American community has suffered from discrimination and that there are many wrongs that must still be made right. RADDATZ: Contrast that to this last month -- unscripted before a fired up, nearly all white crowd. TRUMP: I'm asking for the vote of every single African-American citizen. You're living in poverty. Your schools are no good. You have no jobs. RADDATZ: Earlier this week, another tale of two tones -- acting presidential in Mexico, speaking diplomatically. TRUMP: The bond between our two countries is deep and sincere. TRUMP: I am going to create a new special deportation task force. RADDATZ: So how did that message play? With our partners at SSRS, we asked voters for a one word reaction. Sixty-seven percent had a negative one. Just 27 percent were positive. But Hillary Clinton has her own image problems. Our new ABC News/"Washington Post" Poll showing 56 percent of Americans now see her unfavorably, up 6 points in three weeks. She's still avoiding questions, holding just one public event this week. And she hasn't held a full blown news conference in 274 days. RADDATZ: Let’s bring in the Democratic vice presidential nominee, Senator Tim Kaine of Virginia. Senator Kaine, the FBI released more documents about the investigation into Hillary Clinton’s e-mails and a summary of her interview with the FBI. Let me just highlight what is new. She didn’t seem to know what some classification marks even meant. She said she relied on staff to tell her what was classified. Archived e-mails were deleted even after a Congressional committee requested them. And all she has really said about this is that it was a mistake to use a personal server. Don’t the American people deserve a better explanation? SEN. TIM KAINE (D-VA), VICE PRESIDENTIAL NOMINEE: Well, and I think, Martha, they’ve gotten a better explanation, because to add to what she just said, the reason these materials are being made public is that Hillary Clinton said I want the public to see them. When Congress asked the FBI, give us your notes, Hillary said, yes, that’s great, give them your notes but let the American public see it. And what these notes demonstrate is, in very significant detail, why the FBI chose not to go forward with any additional proceeding. She did make a mistake. And she made by deciding she wanted to use one device rather than multiple devices. She’s apologized for that. She said it was a mistake. And she’s learned from it. But these notes, which Hillary urged be made public, demonstrate clearly why the FBI saw no need for additional criminal proceedings. KAINE: -- the disclosure with a Donald Trump, who won’t even allow the American public to see his tax returns. RADDATZ; Let’s go back to Hillary Clinton. This is an issue that Americans care about. A majority of Americans do not trust her, largely because of this e-mail issue. Sixty-six percent do not trust her in the latest Fox News poll, and our ABC/"Washington Post" poll shows a majority, 55 percent, disapproved of the FBI’s decision not to indict her. So, again, isn’t this an issue that she needs to better explain? KAINE: That’s why she asked that these materials be made public. And I think when you read the materials and read the articles about the materials, they go into significant detail about why the FBI concluded that there was no need for any additional proceedings. RADDATZ; But Senator Kaine, she hasn’t answered questions about this. RADDATZ; Shouldn’t she be answering questions about this? KAINE: I have been -- Martha, I just -- I just have to disagree with you. I have sat with her while she has answered questions, while she’s answered questions about what she did and why, and then she said, look, by using one device I made a mistake. I apologize for it, I’ve learned something, and I wouldn’t do it again. And I want all the facts to come out. I’ll talk to Congressional committees, we’ll provide the material. The FBI released these materials to the public. But on the other hand, we’ve got a candidate in Donald Trump who won’t release his tax returns to the public after he promised to do so. And talk about national security -- he has openly encouraged Russia to engage in cyber hacking to try to find more e-mails or materials, and we know that this cyber attack on the DNC was likely done by Russia. A president was impeached and had to resign over an attack on the DNC during a presidential election in 1972. This is serious business. So contrast the Hillary situation, where the FBI said there’s no need for legal proceedings, with an attack that is being encouraged by Donald Trump on the DNC by Russia, similar to what led to resignation of a president 30 years ago. RADDATZ; OK, Senator Kaine, I want to -- I want to ask you one specific question about Hillary Clinton’s e-mails. RADDATZ; Let me go through a few specifics. From the very beginning of this, Secretary Clinton consistently said she never sent or received any material marked classified. We learned earlier this summer that is not true. But we did learn this week from her interview with the FBI she couldn’t even identify the (c) classification in an e-mail and consistently could not identify classified information in e-mails the FBI showed her. How could she make such definitive statements if she couldn’t even recognize classified material? KAINE: Well, remember, I -- my recollection of the Jim Comey testimony before Congress was that many -- that there were e-mails that contained classified information that had been improperly marked. So when she received the e-mail, the material that was classified, which is supposed to be flagged and identified as classified, in many instances was improperly labeled. Now I’m on two committees in the Senate, the Armed Services and Foreign Relations Committees, where we do look at classified material. But we look at so much material, unless it is specifically pulled out and identified, it is difficult to know, sometimes, whether a statement or a paragraph is classified or not. And that’s what she was saying. Unless it is identified in the way that it should be, it is difficult to know whether a particular material is classified or not. RADDATZ: -- even after decades in government. RADDATZ; I do -- I do want to move on to foreign policy. You’re giving a major foreign policy speech this week emphasizing U.S. Relationships with Russia. I was just over in that region with U.S. Pilots where the tension really is escalating. Hillary Clinton was in charge of the so-called reset with Russia. Can you make an argument that the reset worked, given what’s happened in Crimea, given what’s happened in Syria? KAINE: Look, I don’t think you can make an argument that the relationship with Russia is in a good place right now. But that’s not the U.S.’s fault, that’s -- that's Vladimir Putin’s aggressive and imperialist ambitions. Here is a guy who violated international law at the end of the Bush administration by moving into the Ossetia region of Georgia. And then he’s violated international law by annexing the Crimean portion of the Ukraine and destabilizing the Eastern Ukraine. Donald Trump was not even aware that Putin had gone into Crimea as recently as two weeks ago. He promised that Putin would not and had to be reminded that Putin went in and took over Crimea two years ago. RADDATZ; Let’s go back to the reset. RADDATZ: I want to go back to reset, Senator Kaine. KAINE: -- to pro-Russian elements in Ukraine and Russia. RADDATZ: I want to talk about Secretary Clinton again. Poland’s former minister of foreign affairs told "Time" magazine, "The Russians interpreted the reset as a kind of American weakness. It suggested that NATO is not as strong of an alliance as it was and that gave Russia an opportunity to act." They’re talking about Secretary Clinton there. KAINE: Martha, I think trying to -- yes, but, look, I don’t believe in a "blame America first" strategy. Russia went into Georgia, the South Ossetia region of Georgia, when President Bush was in office, before President Obama was elected. And he went into Crimea during the Obama administration. But to try to say that’s the U.S.’ fault is ridiculous. The guy is a dictator, who represses journalists -- and there’s another tie. Donald Trump is banning journalists from outlets he doesn’t like from covering him on a campaign. He’s taken some lessons from Putin and others. But to say that Putin’s imperial ambitions are the fault of anybody in the United States is ridiculous. RADDATZ; OK, let’s talk about relationships with the press -- and you talk about Donald Trump. Secretary Clinton has not held a press conference in 274 days. You argue that she’s talked to the press on the campaign trail. But our campaign reporters and others say she doesn’t really answer that many questions. KAINE: Martha, she’s had hundreds of interviews in the last year. And I got to push back on the notion that she hasn’t done a press conference. She gave a speech to the National Association of Black Journalists within the last month, where there were also journalists, Hispanic journalists, there. And she did a press conference there. And members of mainstream media outlets, television networks, asked her questions during that press conference. We’re about to switch into a phase of the campaign, where we will be on planes and the press will be on the planes with us, which is something that Donald Trump does not allow. We are not banning press outlets from covering public events. And so, look, all the time, as Hillary is out on the trail, she’s talking to the press, hundreds of interviews. I’m doing the same. The Labor Day to Election Day stretch, it’s going to ramp up even more. But we’re not a campaign that is acting like Putin and other dictators and banning press outlets from even attending public events. That’s not American. But that’s what Donald Trump is doing. RADDATZ; So we can expect a press conference, yes or no? KAINE: There’s been one in the last month and you’re going to see Hillary very, very accessible to the press, as I will be between now and November 8. RADDATZ; OK, thanks very much for joining us this morning, Senator Kaine. KAINE: You bet, Martha. Take care. RADDATZ: Now let's get a response from the Republican side. Joining us is Donald Trump's campaign manager, Kellyanne Conway. And, Kellyanne, good morning. You heard Tim Kaine, pivoting from the e-mail questions to talking about Donald Trump, his relationship with Putin and his relationship with the press. KELLYANNE CONWAY, TRUMP CAMPAIGN MANAGER: Well, it's very disappointing to see Senator Kaine take that tack because you're asking him very honest questions that the American people want answered, 17,448 e-mails were not turned over to the inspector general. That's in addition to the 33,000 emails that had been deleted. And Martha, as you very correctly pointed out, if you see the C as the classification of national security information, folks know what that means. And certainly a former United States senator, former first lady and certainly the sitting secretary of state should know what the C means. I think that the polling data that you showed earlier really tells the tale here. Hillary Clinton is having a hard time being accepted as a truthful and honest candidate vis-a-vis the American people. And I thought that Senator Kaine trying to pivot away to Donald Trump is really become a favorite parlor game these days. I watch Secretary Clinton -- excuse me, Senator Kaine and others who defend them, when you ask them a question about them, it takes them about 10 words to get to Donald Trump's name. That's not how you answer a question. She, they want this election to be about Donald Trump. And the American people want this election to be about honesty and trustworthiness and her being more acceptable and forthcoming in her responses. RADDATZ: Kellyanne, let's -- in that -- in that train of thought, let's go to Donald Trump because that's who you're here to talk about. And I want to tie up some loose ends after Mr. Trump's speech on immigration. He said that the priority will be criminals and those who have overstayed their visas. That still amounts to between 5 million and 6.5 million people that he says will be quickly removed. The cost estimate for that is between $51 billion and $67 billion. How will he manage such a massive operation? CONWAY: He'll manage it the way it should have been managed all along, by enforcing the law and relying upon those law enforcement officers and those ICE officers to do their job. They've been completely hamstrung in their ability to do their job. He also has -- said that he will triple the number of ICE agents to try to help. And if you look at everything that he said in that 10-point immigration plan, Martha, it goes beyond that. It also talks about the eVerify program. It talks about stopping this jobs and benefits magnet. It also talks about securing the southern border, building that wall and having Mexico pay for it. But at least you have a presidential candidate putting forth a 10-point plan and having it covered by the media. CONWAY: -- 10-point immigration plan. RADDATZ: Back to immigration, he said there will be no amnesty; all immigrants here illegally will be subject to deportation. So will they be subject to deportation and removal? Or will they have to go? CONWAY: If they're criminals, they're going immediately. And we don't know what that number is. We hear anything from 1 million to 2 million. RADDATZ: And if they're not criminals, that has been very clear. He's talked about the criminals. But if they aren't criminals, do they have to go? RADDATZ: So you mean they have to go? RADDATZ: OK. But that really doesn't clear it up, Kellyanne. RADDATZ: -- criminals have to go. But, no, but he also said that, once you enforce the law, once you get rid of the criminals, once you triple the number of ICE agents, once you secure the southern border, once you turn off the jobs magnet, jobs and benefit magnet, then we'll see where we are. And we don't know where we'll be. We don't know who will be left. We don't know where they live, who they are. That's the whole point here, that we've actually never tried this. He will rescind all those executive amnesties and try to work with the Congress. And so at least he's trying to solve a problem. And he has said he wants to work with law enforcement and immigration officials to actually see what we have left after everything else is done. RADDATZ: OK, Kellyanne, one more thing to clear up quickly. Mr. Trump said that, in his meeting with Mexico's president, they did not discuss payment for the wall. Mexico's president, Pena Nieto, says he told Trump Mexico will not pay for the wall. Is President Pena Nieto lying? CONWAY: Well, they disagreed on that conversation. But I think Mr. Trump clarified very clearly when he got to Arizona later in that day that he will build that wall. And he has been consistent on that since day one of his candidacy. And he will have Mexico pay for it. So his position has never changed on this side of the border or on that side of the border. And, you know, Martha, all told, that was a very productive conversation. We were very happy to accept the gracious invitation of the Mexican president to have Mr. Trump there, to talk about not just illegal immigration, which of course is a vexing issue for both sides, but also drug across the border, human trafficking and the sovereignty of each nation that is protected once you have a border in place. A prosperous and safe Mexico benefits us. A prosperous and safe United States benefits Mexico. We look forward to continuing that conversation with the Mexican president. And we were very happy that Mr. Trump showed the type of leadership that a would-be president shows by accepting the invitation and showing up. RADDATZ: Kellyanne, let's move to your ground game and the path to 2016. You said Pennsylvania is part of your campaign's path to the White House. You're still down there by an average 7 points and in my recent visit there, lots of people were turned off by Trump's aggressive, angry tone. Can you win this race without Pennsylvania? CONWAY: We can. But we're taking Pennsylvania very seriously. We know the last six presidential elections, it's gone Democratic. And that's -- and that's something that we understand. But we also know that Mr. Trump's message from the beginning has been particularly resonant among a lot of the working -- a lot of the workers who feel like they've been left behind in this economy. RADDATZ: Can you win without Pennsylvania? CONWAY: Yes, we can. Absolutely. We have several different paths to victory. And, Martha, I would point out the growing number of stories just this week about the Clinton campaign, how she's being told just prepare for a landslide. Wait -- you know, run out the clock. Don't go talk to the voters. She's doing this whiplash-like tour between Hollywood, the Hamptons, Martha (sic) Vineyard, raising money and ignoring the voters, thinking, hey, I've got this one. I can win through many different paths through electoral map. And we're taking every state seriously. We're looking at -- we're just making investments just this week with absentee ballot outreach, with ads in about 10, 11, 12 states. Pennsylvania is one of them. Coming up, the two major party nominees are so deeply unpopular that either would break historical precedent if they win the White House. So who has the upper hand? I'll check in with the pollsters. Plus, it could be the greatest foreign policy challenge facing the next commander-in-chief. I took to the skies for a must-see view of the growing threat from Russia. NEWT GINGRICH, FRM. SPEAKER OF THE HOUSE: Donald Trump is the first Republican I can remember who is explicitly saying to the African-American community, things can be better but not with Democrats in charge. If he continues to say it and if he has the courage to go to places like Chicago and say it, I think he'll get far more votes in the black community than any Republican in modern times. RADDATZ: A bold claim from Trump support Newt Gingrich, especially given that just 1 percent of African-American voters support Trump in this week's latest national poll. So, how does he compare to other Republican nominees? Ronald Reagan won 14 percent of African-American voters in 1980, but it's been downhill since then. George W. Bush got 8 percent in 20000, John McCain got just 1 percent in 2008, and in 2012, Mitt Romney, just 4 percent. So where does Trump stand after all this outreach? You'll hear directly from African-American voters next. RADDATZ: Donald Trump dancing and clapping along in a Detroit church yesterday, part of the Republican nominee's recent outreach to African-Americans that includes a softer tone and talk of discrimination and lack of opportunity. But is it working? Trump needs to do better black and Latino voters, especially in Pennsylvania, the key to a Trump victory. We have been tracking the vote in that state all along from blue collar Trump supporters in the west to suburban swing voters in the east. And now to minority voters in the state's largest city. North Philadelphia, in all its rich diversity. This is Clinton country, at least it should be. Do you trust Hillary Clinton? UNIDENTIFIED MALE: Trust. Define trust. RADDATZ: It's not that she has to worry about lots of voters here supporting her rival. And how about Donald Trump? RADDATZ: With the candidate in single digits among black and Latino voters, it takes guts to wear this. UNIDENTIFIED FEMALE: Our country is getting lost in so many ways. RADDATZ: Daphne Goggins (ph) is a proud republican, and Trump's message resonates. UNIDENTIFIED FEMALE: Immigration policy definitely affects us in the job area. They act like black people don't want to work, so it's like just let any old body and everybody, including terrorists or whoever is coming -- we don't know who is coming through. RADDATZ: But Goggins (ph) is the exception. Donald Trump reached out and said to the African-American community what have you got to lose. UNIDENTIFIED MALE: We're not buying it. We're not buying it. UNIDENITIFIED FEMALE: I don't know. I guess I'm voting for her because I'm not going to vote for Trump. I -- I don't really like her. RADDATZ: It's that lack of enthusiasm for Clinton that keeps her strategists up at night. Why? Because the Philadelphia area provides pretty much the only reliable vote Democrats have in this state with a deep urban-rural divide. A couple of months ago, I went to western Pennsylvania to see whether Trump could turn out his base there. Probably yes. UNIDENTIFIED FEMALE: He's no holds barred and he's straight to the point. RADDATZ: Trump needs Pennsylvania. Democrats could end Trump's dreams of the presidency here, but they need that fire wall of urban minority turnout that got Clinton through the primaries. Who are you supporting in the presidential race? UNIDENIFIED FEMALE: Hillary Clinton. I think she's going to be better than Donald Trump. RADDATZ: And you'll definitely vote? UNIDENTIFIED FEMALE: Yes, I'm definitely voting. RADDATZ: One down, many more votes to get out. RADDATZ: So let's take deeper dive into the numbers behind those interviews and a bigger picture look at this race. Joining us now, ABC News contributor Republican pollster Kristen Soltis Anderson and Democratic pollster, Margie Omero. Together they host the podcast, "The Pollsters". Welcome. And Kristen, let's start with you. Despite Trump's overtures this week to the African-American community, polls don't appear to show that minorities are really warming up to him. Trump's national poll numbers have been stuck in the low 40s for the past month, but the campaign talks about the hidden Trump vote that is not represented in the polls. Is that credible? KRISTEN SOLTIS ANDERSON, REPUBLICAN POLLSTER: I think it's pretty overblown. I think if you look at reports of campaigns going back over decades, people will always point to things like large turnouts at rallies and say, we've got a lot more going on here than the polls suggest. There are more supporters and more momentum. The problem is there's no way to have evidence that proves that this missing Trump voter does exist. So, we can't really know. I think given that Trump is down by four or five points in national polls, it's hard to see that big of a swing from a hidden Trump vote. RADDATZ: And Margie, do you think it could make a huge difference for him? MARGIE OMERO, DEMOCRATIC POLLSTER: There may be a difference polls that are done through live calls versus online, perhaps there's some social desirability bias where people feel like they don't want to say that they're voting for Trump, that's not a secret weapons, that's a sign of real weakness. I mean, that's the same effect that is causing Republicans to endorse Hillary Clinton, that's causing Donald Trump to be more unpopular with Republicans than Clinton is among Democrats, this is not a strength, this is a real weakness. RADDATZ: OK, let's -- let's talk about the high unfavorability of Hillary Clinton in particular. A month ago, when you were on the show, you told me that it's yet to be determined whether Clinton had actually improved favorability numbers or whether it was just a post-convention bump. Our poll this week showed that her favorability numbers are worse than they've ever been. And voters I spoke to say they will vote for her, as you heard, but don't necessarily trust her. So does it matter at this point or can Trump keep pounding on that and do her more harm? OMERO: Well, she -- somebody -- one of them is going to win with -- likely with some unfavorables. No disrespect to Gary Johnson. He doesn't seem to be taking off. So you see now, even in a regular election, which this is clearly not, candidates become more unfavorable as they get closer to election day because ads argon, you have debates, obviously. You have a lot more heated coverage as we head to election day. And I think there is more openness for Clinton's favorabilities to move, given how they were after the convention, given that she has been net favorable up until this past year, while this same "Washington Post"/ABC Poll, going back to 1999, Trump has always been net unfavorable. RADDATZ: So -- so Kristen, should Trump keep highlighting this mistrust of Hillary Clinton? ANDERSON: I think absolutely. I think because right now, she has a lead that is commanding, but in some ways, fragile. Because there are so many voters who are choosing between Clinton or Trump, but who really don't like either of them. That's a very fragile place to be if you are supposed to be ahead by 4 or 5 points. And given that even after that great convention, where they got this little bounce, that it has already sort of evaporated and she's hitting record high unfavorables, that's not the place you want to be and suggests that Trump is onto something by continuing to pound that message. RADDATZ: OK, let's do what we did last time again. Who would win the election if it were held today? ANDERSON: So I believe Hillary Clinton would win the election if it was held today. I go back to the exact same map that we had, Obama versus Mitt Romney in 2012. I don't make many changes. The biggest change I've made in the last month is flipping Ohio back into Clinton's camp. OMERO: It's -- you do have to do a lot of gymnastics to really suggest that Trump would win based on the data currently. She's clearly ahead in all the battleground states, even if you give him states where they're tied or Clinton is up 1 or 2, like Nevada or Ohio, you give those to Trump, or North Carolina, she still wins. It's so great to see both of you. RADDATZ: And we will have you both back soon for a regular checkup. RADDATZ: Up next, our Powerhouse Roundtable is standing by with insights and analysis of where this race stands two months before election day. And later, we've seen Russia buzzing U.S. warships, intimidating NATO allies and inching us closer to conflict. I traveled to the front lines for an amazing look at Putin's new threat that you won't want to miss. RADDATZ: We wanted to mark an important moment this morning. Tens of thousands of people from around the world are celebrating at the Vatican, in St. Peter's Square, as Pope Francis makes Mother Teresa a saint in the Catholic Church. The Nobel Peace Prize winning nun worked in the slums of India caring for the poorest of the poor. She died in 1997. After the ceremony in Saint Teresa's honor, Pope Francis hosted over thousand -- a thousand poor and homeless people for pizza at the Vatican. Back to politics with our roundtable after a quick break. RADDATZ: And we're back now with the Powerhouse Roundtable, ABC News chief political analyst, Matthew Dowd; ABC News contributor and ESPN senior writer, LZ Granderson; Associated Press chief White House correspondent, Julie Pace; and host of NPR's "Morning Edition," Steve Inskeep. Welcome to all of you. So much to talk about this morning. I want to start with Clinton's FBI interview that was released this week. You heard Tim Kaine basically say, you know, nothing to see. She's -- she's made a mistake. Let's move on. Is it damaging? Is this week any more damaging than it has been in the past? MATTHEW DOWD, ABC NEWS CHIEF POLITICAL ANALYST: First, a shoutout to St. Mother Teresa. A great day. And it's an example of humble servant leadership that we'd love to see in the course of this campaign. I think it's really damaging, because it feeds two problems she has. The first problem is, as you noted in the earlier segments, is that the majority of the country doesn't trust her and this only adds to that problem in this. The second problem is it looks like it's just typical Washington, D.C., status quo, corruption. They only do it for themselves, in it for themselves, they're not transparent. And both of those things are not helpful in a race that though she has a lead, is fundamentally going to be very close until the very end. RADDATZ: And, Steve, I want to ask you, this document dump was Friday -- the old typical Washington Friday afternoon before a holiday. So, do you think it will really resonate with voters? STEVE INSKEEP, NPR: Well, it has resonated over time. And of course the Clinton campaign is very frustrated that we in the media talk about it so much, but it is a thing that people can grab on to. In your interview with Kellyanne Conway, the Trump campaign manager, she made a very perceptive point. She said Clinton's people want everyone to be thinking about Trump, and then change to try to talk about Clinton. This is an election where each campaign seems to prefer that voters go into the voting booth thinking about the other guy. And that's a very strange place to be. RADDATZ: And Julie, just one more thing on the emails. The State Department is going to release Secretary Clinton's schedule. And that will put a focus on the Clinton Foundation and if anything was going on between the Clinton Foundation and the State Department getting special access. What do you expect from that? Do you know anything about what that will show? JULIE PACE, ASSOCIATED PRESS: I think it's important to NOTE that the state department is doing this under pressure from the Associated Press and other news organizations. This isn't something that they have been willingly putting it out there into the public. Right now, we have about half of her detailed schedules. This will be another fairly substantial period if you look at the information we do have, it does show some overlap between the meetings that she had that she had most discretion over and Clinton Foundation donors. You are likely to see something similar to some extent in these other schedules. RADDATZ: And LZ, let's move to this unfavorability, because it's such a big topic, because they're both have such high ratings. Our polls showed that Clinton's rating is at an all-time low among registered voters, now on par with Donald Trump at 59 percent and 60 percent respectively. You heard Tim Kaine. Is the campaign doing enough to try to solve that problem? LZ GRANDERSON, ABC NEWS CONTRIBUTOR: Well, I they think what they're doing is not adding to the problem. You know, I speak with people inside her circle, and one of the reason why they don't like her in large groups or to do press conferences is because she doesn't play well there. She's not comfortable in that position. That's only going to make her look more staged, more strategic and less authentic. And so, it's a purposeful strategy why she's not doing press conferences, because that will only add to her unfavorabilities. Look, the email thing, is just terrible, in my opinion, especially when you start looking at the rationale. You know, Matthew and I were joking. She thought the "c" was to help her put things in alphabetical order. But there's no "a," there's no "b," and there's no "d."
RADDATZ: And she's been at it for decades and decades, as the senator on the armed services committee and other things. DOWD: She is judged -- she is judged a little bit, I have to say, all of the controversy surrounding her and they're both -- Donald Trump and her, she's judged a little bit on a Ginger Rogers standard, which is, is that the bar is so low for him. I mean, Ginger Rogers, the famous like she did everything Fred Astaire did but backwards and in heels. The bar is so low for Donald Trump that we let it pass that his foundation mistakenly, or did whatever, a contribution to the attorney general of Florida that actually in the end she dropped a suit against him on his university. Both of them have problems. Here's -- Martha, I want to make one point in this, do they each need to solve their likability problems and their trust problems in this election? Yes. But more importantly, I think they need to solve them. And if Hillary Clinton get elected in this election with the majority of the country not trusting her and not liking her, it is going to be very difficult for her to govern as president of the United States. RADDATZ: Either one of them. RADDATZ: when you look forward four year, that's our next story. We'll wait until after the election day on that. Let's talk about Trump's trip to Mexico, Steve. His visit to Mexico. He was different here than he was there. He was down there in Mexico, and so soft and came back here and just ripped right back into that immigration plan. I want to say here, though, I've watched diplomats over the years and sometimes they say something very different when they're overseas than when they're back home. INSKEEP: Oh, sure. That is not too surprising. But there's a little bit of insight we got about Donald Trump when he talked with Laura Ingraham, the conservative host the next day. He was explaining the difference in tone. And he said, well if I spoke like I did with the president of Mexico to that crowd in Phoenix, it would be really boring. They'd fall asleep, which is a funny line and he said it before. But it also raises a question, are you being pulled along by the crowd into position that maybe aren't in the best interest of your campaign or in the best interest of the country. Who are you playing to there? It raises a question that every candidate has to face. RADDATZ: And then does he look like a Washington politician, Julie? PACE: And that I think is actually the biggest risk for Donald Trump. If you look at his immigration speech, yes, he did clarify that he will stick with the wall, he will have Mexico pay for it, various other pieces about deportations, but he left open in way that most politicians often do, the toughest part of his issue, which is what you do with the people who would be left here, who are not legal, do not commit crimes. That is why this problem is so difficult. Donald Trump casts himself as someone who will tackle the hard problems, tell people the solutions even if they're not what they want to hear. And yet in this opportunity to do so, he passed. RADDATZ: And hard as we try, we can't get that single yes or no answer. And LZ, what are your thoughts on his trip down there -- different here, down there? Too tough on immigrants? How does he attract the minority vote? GRANDERSON: Well, I don't think he will. I don't think he's trying. I think he's trying to make white people feel better about voting for him, because white voters don't want to vote for a racist. So, if he doesn't look as if he's a racist, then you feel better about voting for him. Nothing that he's done or said within the last three week, in my opinion, seems attractive to minorities voters largely speaking. RADDATZ: So, do you think he was reaching out to white voters yesterday? GRANDERSON: Absolutely. He's in a black church. He's there clapping and swaying. They go, look, he's not a racist, he's there with black people. DOWD: Here's something really interesting about this election is that Donald Trump could win this election and get the lowest level of nonwhite support that anybody has ever won with as president on the Republican side. The other interesting thing is Hillary Clinton could win this election with the lowest level of white support of anybody since George McGovern lost in a landslide to Richard Nixon. These -- both sides are actually appealing to a certain segment of the country in a certain way to get 43 or 44 percent of the vote and another, as another part of this thing, that is not going to go well as we go through this and in the aftermath of this election. DOWD: George W. Bush -- I have to give some credit, George W. Bush in 2000 and 2004 set new standards on the Latino vote and actually tried. Unlike with a lot of Trump folks are saying it's the first time a Republican has appeared in a black church, which is totally wrong. It's not true. And it's the first time Republicans have appealed to black voters, totally wrong, in the course of this. But you're right, it's been a problem. And it continues. Whites are problems for Democrats, and nonwhites are problems for Republicans. RADDATZ: And Steve, upcoming debates, moderators chosen this week. I will say, yes, I was chosen as a moderator. Just to get that out there. RADDATZ: The first and last round of applause I'll get on that one, that's for sure. But Steve, can the debates reset this race? INSKEEP: No. I mean, they don't. They don't. INSKEEP: You over time, you look over time, polls don't necessarily change all that much because of debates. There will be drama. It will be a spectacle to watch. And I'll be you and listening to your questions. RADDATZ: Well, hope it's not a spectacle, OK.
INSKEEP: Well, it's going to be some kind of spectacle, maybe not in a bad way. It's going to be extraordinarily interesting. It's extraordinarily important to our democracy that everybody or a lot of people anyway sit down and watch these people and think about them. But these are two individuals who have been in the public eye for decades. And so one night is not necessarily going to make a difference unless one of them -- something horrible happens. DOWD: Singular debates have effects. Debates overall don't, singular debates have an effect. I think there's this debate has a huge upside for Donald Trump, potential and a huge downside for Hillary Clinton. DOWD: I'm not saying he's going to win. RADDATZ: Julie, I want to end with you, does Donald -- what would you do if you were Donald rump when you do approach these debates? Is it the Donald Trump that attracts the voters he has now or does he change slightly, or is there something in between? PACE: I think Donald Trump's biggest weakness right now in a general election is that a lot of voters don't see him as presidential. He needs to go on stage -- his base will stay with him. They are loyal to him through and through. He needs to go up there and look like someone that people can imagine for four years sitting in the Oval Office going around the world and meeting with world leaders. INSKEEP: Read a briefing book before the debate, that would be my advice. Read a briefing book. RADDATZ: All right, all right, all right. Enough, enough, enough. OK, thanks to all of you. I know we'll be keeping track of all of you in the next couple of months. Thanks again, guys. UNIDENTIFIED MALE: Here we go. In the Gs. RADDATZ: Pulling 6 Gs in the skies over Eastern Europe. We go inside the incredible war games meant to deter Russian aggression -- next. RADDATZ: President Obama, meeting with the world's top leaders at the G20 summit in China, where he's expected to also go one-on-one with Russian president Vladimir Putin. The meeting comes as America's allies in Eastern Europe face an increasingly aggressive Russia and fear further incursion like Putin's annexation of Crimea. It's a threat our next commander in chief will face. And we took to the skies over Estonia for a first-hand look at what the U.S. military is doing to counter it. RADDATZ (voice-over): Taking off in an F-15 vertically, a backseat ride with the U.S. Air Force. UNIDENTIFIED MALE: Here we go, in the Gs. RADDATZ (voice-over): We're flying along the newest front line in a reignited Cold War, where tensions with Russia have steadily escalated, Russia unafraid to flex its muscles, buzzing U.S. warships. UNIDENTIFIED FEMALE: We have two Russian (INAUDIBLE) 24s currently (INAUDIBLE) multiple passes. RADDATZ: Inching us closer to conflict. To counter: war games, the U.S. training with its European partners. LT. COL. JASON ZUMWALT (PH), USAF: Our main goal as an air superiority force is to try and keep the enemy as far away from what we're trying to protect as we can. RADDATZ: Lt. Col. Jason Zumwalt (ph) explains today's mission, 10 F-15 fighter jets split into two groups. I'm one of the bad guys. ZUMWALT (PH): We're going ID you. We're going to target you and we're going to make you go away before you can get to what we're trying to protect. RADDATZ: And when you say make me go away? ZUMWALT (PH): We're going to shoot an air-to-air missile at the enemy aircraft, they have a very good chance of success. RADDATZ: Not a real missile but they are trying to replicate real threats. My pilot, Major Ben Leetsma (ph), called Sign Trap (ph), has been flying for 14 years. RADDATZ: You're training but some real-life thing could happen any minute. MAJOR BEN LEETSMA (PH), USAF: We're prepared to handle that if required. And lucky for us to this point, we have skated clean. UNIDENTIFIED MALE: There we go. Roll in left. RADDATZ (voice-over): Back in the sky, a 360-degree turn. The dogfight is on. UNIDENTIFIED MALE: (INAUDIBLE) fight's on. UNIDENTIFIED MALE: We'll try to target them. They will more than likely target us first and kill us out. UNIDENTIFIED MALE: (INAUDIBLE) group bull's eye, 2-0. UNIDENTIFIED MALE: Viper 6 (ph) is dead. UNIDENTIFIED MALE: Yes, we got shot. RADDATZ (voice-over): At times, pulling more than 6 Gs, the F-15s practicing precision air-to-air combat. RADDATZ: We're flying over Estonia now but just over to the east, to the right, is Russia. RADDATZ (voice-over): Moments later, we hear directly from the Russians, real Russian pilots. UNIDENTIFIED MALE: The volume (INAUDIBLE) is (INAUDIBLE). RADDATZ (voice-over): Over the radio, a warning: territory, territory, the Russian pilots cautioning the Americans about crossing their border. The Americans deny that, calling this just another provocative tactic, the mission ending without incident. PRESIDENT OF ESTONIA: When the world stands, you see aggression, you see aggression around you, then you have to have real exercises. RADDATZ: What do you think Putin's intent is? PRESIDENT OF ESTONIA: There's no rhyme or reason or logic to it, other than perhaps to keep everyone off balance. I'm more afraid about some stupid accident. This is why being in NATO is very different from not being in NATO in this part of the world because there's NATO deterrents. Then they don't know what to expect, should they do something. And that's a big difference. RADDATZ (voice-over): One big reason why exercises like these will continue. RADDATZ: For more on this, let's bring in ABC News contributor, retired Colonel Steve Ganyard, former deputy assistant secretary of state and a former Marine Corps fighter pilot. Must have brought back some memories there, Steve. COL. STEVE GANYARD (RET. ), ABC NEWS CONTRIBUTOR: You're making me jealous. RADDATZ: OK. Let's talk about what's happening over there. NATO aircraft are conducting up to five intercepts every single day of these Russian aircraft in the Baltic Sea. Back in April, we saw the Russians come dangerously close to U.S. warships there. And the Russians are about to start their own massive military exercises along the borders of Eastern Europe. GANYARD: A couple of things. Putin knows that the Baltics are weak. And so it allows him to flex his military muscles in ways that appeal to Russian nationalists. It covers up for a weak economy. But the real goal here may be the Ukraine. And so by tying down NATO in the north, they cover up and provide a smokescreen for a potential invasion this fall of the Ukraine. RADDATZ: And so even these exercise tying up troops and everybody's focus up there, Lt. Col. -- Lt. Gen., rather, Ben Hodges, who's the commander of the U.S. Army in Europe, has said Russia could conquer the Baltic States quicker than we could get there to defend them. With all the military power of NATO, why are these countries so vulnerable? GANYARD: I'm sure when you were up flying, you looked at the terrain. And you saw how flat that terrain is. That is optimum tank terrain. So because we can't have our NATO troops so far to the south, it would take too long to reinforce into the Baltics. The Russians, by most intelligence estimates, could be all the way through and retake the Balkans in three days or less. This is why what you saw was so important because air power is the deterrent, the only deterrent really that NATO has to prevent a Russian incursion into the Baltics. RADDATZ: And you actually think Putin would really make that move? GANYARD: I think what he's going to do is make sure that people don't want to call his bluff. So I think the real goal will be in the Ukraine; there's less risk. There's bigger payoff. The Russian people will buy it. But I think a bet, a direct confrontation with NATO at this point is a bigger bet than Mr. Putin will be willing to be taken. RADDATZ: And very quickly, Steve, no one can read Putin's mind. But is this connected to the presidential race in any…? GANYARD: I think the WikiLeaks are. I think the DNC hacks are. But I think what we see in the Baltics today appeal more to the G20 that's going on in Guangzhou, China. But ultimately it's going to be we need to keep our eyes on the Ukraine in the next weeks and months to come. RADDATZ: OK, thanks very much. Always great to see you. And I know you were jealous about that flight. RADDATZ (voice-over): In the month of August, three service members died overseas, supporting operations in Iraq and Afghanistan. RADDATZ: And that's all for us today. Thanks for sharing part of your Sunday with us. Check out "WORLD NEWS TONIGHT." Have a great Labor Day.